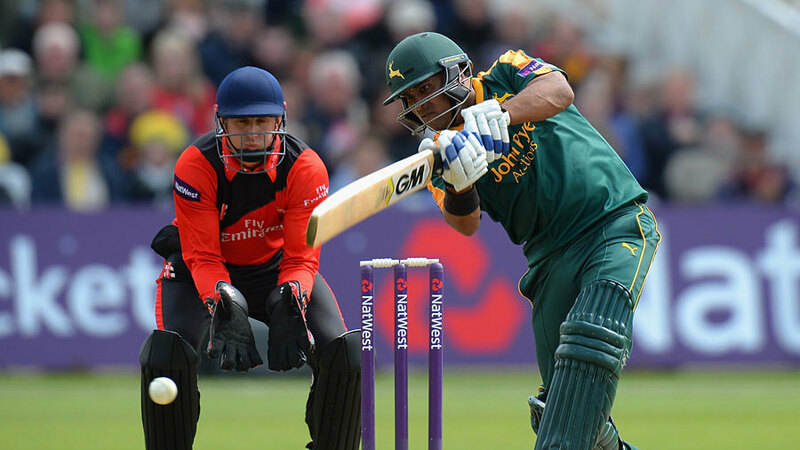 A whirlwind 36 not out off 16 balls by Darren Sammy and a key wicket for Samit Patel tipped the balance as Nottinghamshire got their NatWest T20 Blast campaign back on track with an 11-run win against Worcestershire at New Road. Sammy smashed four sixes straight down the ground in turning an average score into a more challenging 169 for 5 and Patel, having made 30 with the bat, dismissed Moeen Ali for 36 in a match-defining spell of 3 for 17. Moeen has been making the most of his sabbatical from the England set-up, scoring 90 in a win at Northampton in Friday and threatening to do the same to Nottinghamshire with seven boundaries in his smooth progress to 36 from 24 balls. Although he had already lost two partners in Daryl Mitchell and Richard Oliver - the latter a first success for Australian newcomer Ben Hilfenhaus - Moeen's wicket was the one that Nottinghamshire needed and Patel jubilantly claimed it when the opener was trapped lbw attempting a reverse paddle. Patel's guile was too much for batsmen having to take risks. New Zealander Colin Munro put up a catch to long-on and Ben Cox was out lbw when aiming to sweep. Ross Whiteley did his best to revitalise the Rapids with four sixes before he was bowled by Harry Gurney for an 18-ball 36 and the result was only settled when James Taylor brilliantly caught Jack Shantry at extra cover for 12 in the last over as the hosts were dismissed for 158. The day had begun badly for the Outlaws. Losing both openers to successive balls in Shantry's opening over was not the best way to get back into Mick Newell's good books after the director of cricket branded Friday's performance in defeat by Leicestershire as "unacceptable." Riki Wessels put up a straightforward skier to mid-off and a flying catch by wicketkeeper Cox was an unhappy memory for Alex Hales to take into the England squad for the one-day series against New Zealand. Yet the Outlaws were quickly on track as Steven Mullaney and Brendan Taylor put on 57 in six overs before Saeed Ajmal retrieved a costly start when Taylor holed out to Munro at midwicket. As Worcestershire switched to spin, Mullaney fell to a remarkable one-handed reflex catch by Mitchell at short midwicket in Moeen's first over. Nottinghamshire had an answer once again, though, with 55 in eight overs by Patel and James Taylor, who reached an unbeaten 35 in his last innings before joining Hales on England duty. In a way, Patel's dismissal, driving Joe Leach to long-off, was counter-productive in exposing Shantry to a brutal assault by Sammy. The West Indies allrounder drove for six and took a single from the last two balls of the left-arm seamer's penultimate over and closed the innings with three more sixes into the Basil D'Oliveira Stand in scoring 23 of the 24 taken from Shantry's last six deliveries.